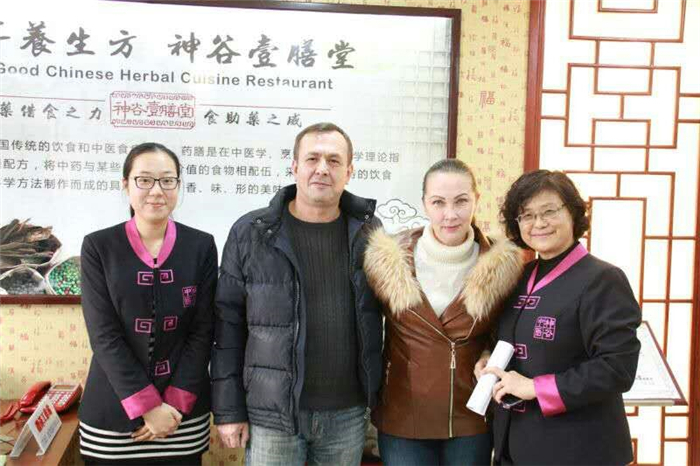 On Oct. 31, 2016, Sveda and her husband Mr. Sacha came to Sun-good hospital of TCM to take a vacation and receive treatment. Stuffs of international division of the hospital, holding flowers to show welcome, leaded the couple to guest room No. 303 of Sun-good hospital and then had a lunch together joyfully. During the 21 days of the vacation and treatments in Sun-good hospital of TCM, they got a fully care through Chinese medicine care, tasted all kinds of delicious Chinese food, and had sightseeing of the coastal scenery of Dalian and Lushun, and also historical museums. All those impressed them much. Sveda, suffering from type I diabetes, gets an Avg. blood glucose of 22. Through the treatment of TCM, the blood glucose level decreased to 7. While her husband Sacha had a frequency of urination, he gets up to piss many times for one night, which has been impacting his life quality awfully. After receiving acupuncture, herbal supplement and massage treatments, he slept well, which relieved his sickness and achieved a good effect. What a professional hospital and what nice people! You are using Chinese medical treatment to make miracles. The work you are doing is a great work, which benefits people here and there. Now we are leaving, but our hearts are always with you.